The Victory in 2015 group is not representative of anyone except themselves, it told the Central Elections Committee Thursday. The Victory in 2015 (V15) campaign, which Likud has accused of representing foreign agents set on interfering in Israel's upcoming elections, is not representative of anyone except themselves, the group said Thursday. 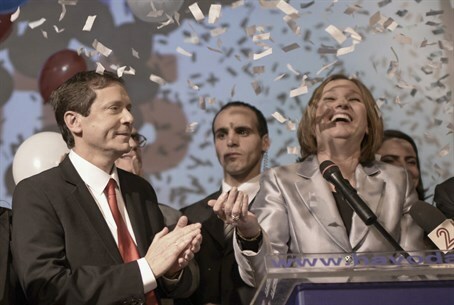 In a dramatic press conference last week, Likud MKs presented what they said was evidence of V15's collusion with non-Israeli interests to swing the election toward Labor-Hatnua Chairpersons Yitzhak Herzog and Tzipi Livni, Netanyahu's rivals for the prime minister's seat. According to Likud MKs who spoke at the press conference, the project is headed by several former Obama campaign managers aimed at unseating Likud and installing a left-wing government in its place. According to reports, V15 is led by, among others, Jeremy Bird, who was the national field director for US President Barack Obama’s 2012 campaign. V15 is also backed by a the leftist One Voice organization, which receives money from the New Israel Fund, which raises most of its money in the US and Europe. According to the reports, V15's job is to recruit tens of thousands of volunteers for house-to-house canvassing, knocking on anywhere between 150,000 and 1 million doors — a method that was effective in Obama’s first presidential campaign, in particular. Last Friday, the Likud filed a court motion against the V15 campaign, claiming it was acting as a vehicle for foreign political actors to directly influence the outcome of March elections, in contravention of Israeli law. "The obvious purpose of the law is to prevent interference in the Knesset elections campaign using foreign money that could be funneled into campaign propaganda and by limiting the amount of individual donations," claimed Dr. David Shomron, who submitted the petition. "It is obvious that the injection of so much money without accounting and without supervision is likely to enable extremist foreign actors to influence the elections. But V15 said that the allegations were false. “There is no coordination; not directly nor indirectly, not even for the purpose of preparing this response to the petition, between the group and any one of the parties or personalities within any of the parties,” the group said in its response.